"No, because it will be a sham. There can be no talks," Sibanda said, asked if the MDC would participate in the national dialogue talks. Sibanda also argued that the agenda of the Mnangagwa-proposed talks skipped over vital issues relating to the country's legal and economic environment. "We have been told that it is a post-election dialogue and the agenda does not include some of the important questions around the application of the constitution, the legitimacy of the government, and also how to turn around the economy," Sibanda stated. According to Sibanda, Mnangagwa ignored security problems in the country when he called a national dialogue congress. "We have a terrible security situation in the country and we are being provided with a venue. We certainly don't think that the venue is safe. Therefore we don't think that President Mnangagwa is being genuine," Sibanda said. Earlier on Wednesday, Mnangagwa said he had called a meeting of all political parties, in a bid to kick-start the national dialogue. "I have invited the leaders of all political parties to come together, without preconditions, to begin a process of national dialogue. Let us all put the people first and politics second," he tweeted. I have invited the leaders of all political parties to come together, without preconditions, to begin a process of national dialogue. Let us all put the people first and politics second. — President of Zimbabwe (@edmnangagwa) 6 февраля 2019 г. Calls for a national dialogue have been getting louder in Zimbabwe in light of the country's violent suppression of nationwide protests against increased fuel prices, which came into effect in mid-January. According to media reports, over 10 people have been killed in protests, while dozens of others have received gunshot wounds. The violent turn of the events caused the country's government and opposition to clash in an exchange of accusations. 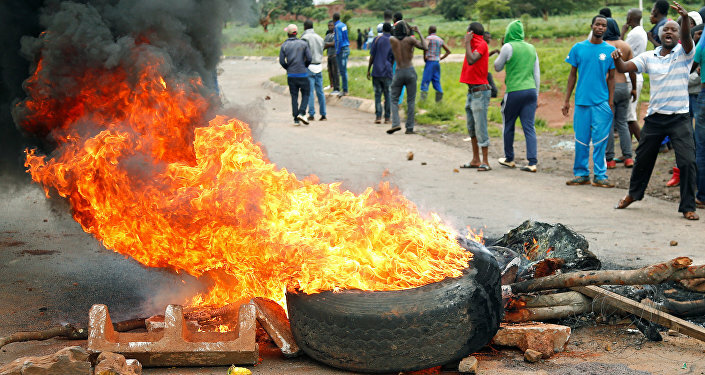 Protests began in Zimbabwe on January 14 after fuel prices rose 150 percent across the country. Demonstrators initially took to the streets of the country's capital of Harare and second-largest city of Bulawayo that day, after which protests spread across the nation. Zimbabwe held a general election in 2018. The MDC Alliance secured 64 out of 210 seats in the National Assembly, while its candidate Chamisa came second in the presidential race with 44.3 percent of the vote. The ruling Zimbabwe African National Union-Patriotic Front (ZANU-PF) secured an absolute majority in the National Assembly with 144 seats while its candidate, Mnangagwa, was named the country's president. The MDC wasn't satisfied with the results, claiming that it had sufficient evidence to void the results over election irregularities. The country's Constitutional Court, however, ruled that Mnangagwa had been duly elected.